This slow cooker beef curry will melt in your mouth. 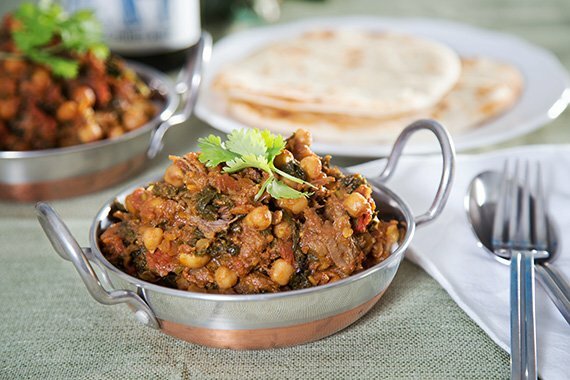 Packed with kale, chickpeas and lentils, the texture and flavour are matched only by it's nutritiousness. Important Note: This is a 'slow cook' recipe, so it must be started in the morning. You can also cook in a low oven, around 120°C, in an oven tray covered with foil for 8 hrs. Wash the fresh produce. Peel and medium dice the onion. De-stem the kale and roughly chop leaves. Pick the coriander leaves (reserving for garnish) and roughly chop the stems (discarding the roots). Preheat oven to 200°C. Wrap the na’an in foil and place directly on the oven rack, and heat for about 5 minutes, or until warmed through and soft. Remove cinnamon stick from the curry. Add coriander leaves (keeping a few to garnish) to the curry and give it a good stir before dividing between bowls. Taste and season with salt and pepper as needed. Serve na'an alongside and garnish with reserved coriander leaves. Enjoy!